In 1610, the Italian astronomer Galileo Galilei looked through his telescope at the sun and saw objects which all the world's scientists agreed could not exist. For centuries, astronomers had believed that objects in space were unblemished and unmarked. Everyone knew that the moon had dark areas, but astronomers believed that other objects such as the sun were pure and unmarred. Galileo was one of the first scientists to see dark spots that travelled across the face of the sun. He noticed that the spots were at their widest when they were at the center of the sun's face, and that they grew more narrow as they travelled closer to the edge of the sun's face. Everyone who looked through the newly invented telescope agreed that the sunspots were there, but astronomers could not agree on what those spots were. Astronomers knew that when Mercury or Venus travelled between the sun and the earth, those planets looked like dark spots against the sun. Because of this, the German astronomer Christopher Scheiner argued that these newfound sunspots were planets orbiting the sun. Galileo had another idea, and his idea arose from his knowledge of mathematics. Buts the mathematics he used to solve the mystery of the sunspots was not developed by scientists – it was developed by artists. Fifteenth-century Italian artists had been interested in the problem of how to draw objects with three dimensions – height, breadth, and width – on two-dimensional paper. They used their knowledge of mathematics to develop a set of techniques called perspective. With these techniques, artists could show on flat paper what solid objects appear like to an observer. One technique that artists used was foreshortening, which is a way to show what objects look like when they are viewed from an angle. For example, hold a ruler about a foot away from your eyes. Now take a book and hold it several inches behind the ruler, with the book cover facing you. Measure the book. Then turn the book so that its spine is pointed toward you. As you turn the book, something odd will happen. The book, as measured by the ruler, will appear to shrink and grow more narrow. This is called foreshortening, which means that an object viewed from an angle appears more narrow than if it is viewed straight on. The only object that cannot be foreshortened is a ball or sphere, which always appears the same shape from whatever angle you view it. Although a sphere cannot be foreshortened, objects that are on a sphere are foreshortened as the sphere turns. You can see this happening if you look at a world globe or a round balloon. When an object drawn on such a sphere faces you directly, it appears to be its real shape. But as the globe or balloon turns, the object on the globe or balloon changes its angle and appears more narrow than when you looked at it straight on. 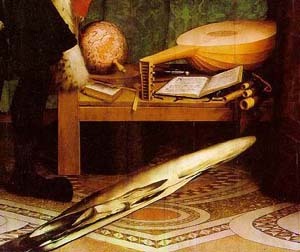 Galileo knew about the techniques of perspective that artists used, for one of his closest friends was an artist. Because of this, he was better able to interpret the sunspots he saw than Scheiner had. Galileo realized that the sunspots appeared to be changing shape as they travelled across the sun's face because the observers on earth were seeing the spots from different angles. Therefore, the sunspots could not be sphere-shaped planets orbiting the sun, as Scheiner had argued, for spheres do not change shape as you look at them from different angles. In 1632, Galileo described his own ideas about sunspots in a book called Dialogue Concerning the Two Chief World Systems. In the book, a clever character named Salviati describes the way in which sunspots change shape. The reason that the spots change shape, Salviati says, is that they are on or near the surface of the sun, and they are being foreshortened as they travel around the sphere: "For around the center [of the sun's face, the sunspots] are seen in their majesty and as they really are; but around the edge, because of the curvature of the spherical surface, they show themselves foreshortened." This fact, Salviati sarcastically adds, is obvious to any observer – any observer, that is, who is "not in the rankest ignorance of perspective." Because of the mathematics of perspective, artists learned how to draw realistic paintings. And in turn, Galileo was able to use the artists' mathematics in order to solve the mystery of the sunspots. Today we believe that sunspots are cooler areas on the sun's surface. Astronomers owe this discovery to math – artists' math, that is. Dauben, Joseph W. The Art of Renaissance Science: Galileo and Perspective. No date. Edgerton, Samuel Y., Jr. "Geometrization of Astronomical Space: Galileo, Florentine Disegno, and the 'Strange Spottednesse' of the Moon." In The Heritage of Giotto's Geometry: Art and Science on the Eve of the Scientific Revolution. Ithaca: Cornell University Press, 1991. 223-253. Galileo Galilei. Dialogue Concerning the Two Chief World Systems – Ptolemaic & Copernican. Translated by Stillman Drake. 2nd edition. Berkeley: University of California Press, 1967. —. "Letters on Sunspots." In Discoveries and Opinions of Galileo. Translated by Stillman Drake. New York: Doubleday Anchor, 1957. Kemp, Martin. "Perspective from Durer to Galileo." In The Science of Art: Optical Themes in Western Art from Brunelleschi to Seurat. New Haven: Yale University Press, 1990. 53-98. Panofsky, Erwin. Galileo as a Critic of the Arts. The Hague: Martinus Nijhoff, 1954. Shea, William R. "Galileo, Scheiner, and the Interpretation of Sunspots." Isis 61 (1970), 498-519. Van Helden, Albert. "Sunspots" and "Galileo's Sunspot Drawings." In The Galileo Project. (1995). 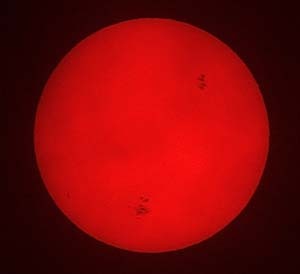 A 2003 photo of the sun, showing sunspots. Courtesy of PDPhoto.org. 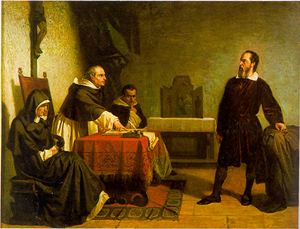 Cristiano Banti's painting Galileo Facing the Roman Inquisition, 1857. Galileo, who was Roman Catholic, got into trouble with church authorities because of his caustic criticisms of traditional beliefs about the universe. 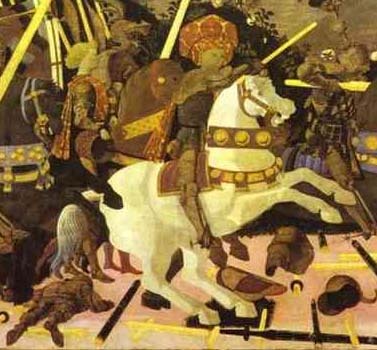 Detail from Paolo Uccello's fresco, Niccolo Mauruzi da Tolentino at the Battle of San Romano, about 1438-1440. The fallen soldier in the bottom left-hand corner, and the spear beside him, are foreshortened. Detail from Hans Holbein the Younger's painting The Ambassadors, 1533. The mysterious object at the bottom is a trick in perspective. If you look at it from the correct angle, you can see that it is a skull. This text, or a variation on it, was originally published at duskpeterson.com. Copyright © 1997 Heather Elizabeth Peterson. Some rights reserved. The text is licensed under a Creative Commons Attribution Noncommercial License (creativecommons.org/licenses/by-nc/3.0). You may freely print, post, e-mail, share, or otherwise distribute the text for noncommercial purposes, provided that you include this paragraph. The author's policies on derivative works and fan works are available online (duskpeterson.com/copyright.htm).